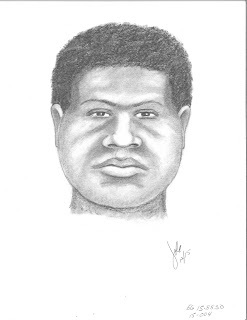 Elk Grove Police has released a composite sketch of a suspect wanted in connection with a recent attempted sexual assault. On Tuesday, December 8 at 1:30 p.m. a 64-year old woman was walking on the sidewalk near Alpinespring Way and Meadowspring Drive when she was approached from behind by an unknown suspect. The suspect pushed the victim down to the ground and attempted to pull off her leggings. The victim screamed after she saw that the suspect was attempting to pull down the front of his sweatpants and the suspect fled on foot. The victim suffered minor injuries that did not require medical treatment. The suspect is described as an African-American male adult, 5’11”, 190 to 200 lbs., approximately 18 to 20 years of age, wearing a black hooded sweatshirt, gray sweatpants, and white athletic shoes. With the assistance of a composite sketch artist, a sketch of the suspect was created (see above). Anyone with information regarding this crime is asked to call the Elk Grove Police Department Detective Bureau at (916) 478-8060 or Crime Alert at (916) 443-HELP (4357). Callers to Crime Alert can remain anonymous and may be eligible for a reward of up to $1,000.00. Tips can also be sent via SMS text message by entering CRIMES (274637) on a cell phone, followed by Tip732 (agency identification number) and the message. Elk Grove is becoming the new South Sac. Good thing I have a concealed weapon permit. Guess I better be carrying all the time. Elk Grove, a city with bunch of low income housing with very little jobs for black youth.